I’ve sent five more down the mailbox chute! 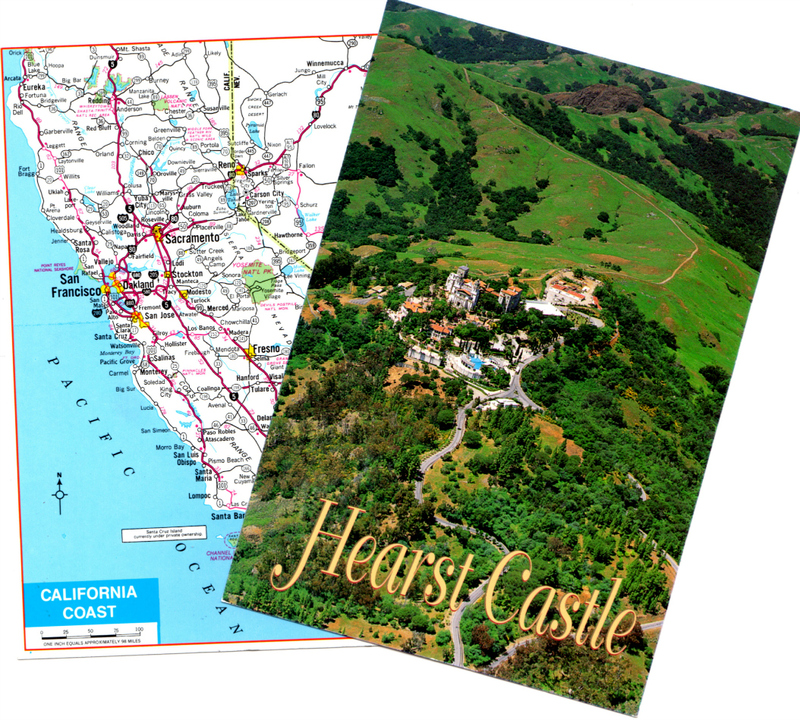 We start with two views of Hearst Castle. The majestic exterior is a Postcrossing draw going to Texel, Netherlands, and the dank interior is a Postcard United draw which if all goes well will wind up in Magdeburg, Germany. Rapunzel is headed for Hong Kong in a Postcrossing Forum tag. The recipient likes Disney princesses. This is a piece of concept art from one of the “Art of Disney” sets. Have you ever noticed how the concept art (especially now in the digitally-rendered film age) is so often much more beautiful than the final product? The Smurfs are off to Novosibirsk, Russia (the third-most populous city in Russia after Moscow and St. Petersburg), in a Postcrossing Forum tag that’s all about looking at your partner’s favorites, and sending them a card you think they will like. I know she’ll like this card, because it was one of her favorites! Finally, Fremont went off via Postcard United to Tainan, Taiwan. The recipient was interested in seeing & learning about local geography, so I told him about the winding canyon road near here that has been so often closed due to mudslides in unseasonably-heavy rains. The Hearst Castle card is off in a “USA-Asia” trade to a Postcrosser in Wuhan, China, who says she is interested in postcards depicting famous places from their senders’ countries. The other card goes out in the rarely-clicked-upon Snoopy/Peanuts tag trade, and it’s headed to a recipient in Tokyo, Japan, who says she loves Snoopy so much, she’s got a stuffed Snoopy that’s been with her for over 20 years, and she is looking to amass a collection of Snoopy postcards from all over the world. Well, I made that card as Snoopy-stuffed as I could. Between the front of the card & the back (see below), I count 11 images of Snoopy! Hope she likes it. She also tagged me in the thread, so I should be getting (another) cool Snoopy card from Japan at some point! and to Lithuania, traveling 7 days and 5,775 miles. So, now it’s time to send out 2 more postcards! Picked these up during a little day trip down to California’s Central Coast a couple of weeks back. Made several stops to increase my postcard stockpile. I THINK both of these came from a gas station in the city of Paso Robles! The card on the left is going to Stonava, Czech Republic. The young lady had a list of demands (including “send coins”), most of which I ignored, except for her request to send a map card. And yes, I did follow her instruction to check her posts of received map cards to make sure this was not a duplicate. Pfft. The view of Hearst Castle goes out to Medicine Hat, Alberta, Canada.